It has been 28 years since the red, yellow and silver train hauling the “World’s Largest Midway” rumbled to a stop on the weed-grown rails of Regina’s Exhibition Park -- the last stop on the show’s summer tour across Canada. “Between the dates, the long train rides were for social times and rest,” says Laura Sedlmayr, heir to the fallen midway. Laura, who lives in Tampa, Fla., fondly remembers the summer trips to Canada and of course, Regina’s Buffalo Days, where in 1975 her father’s empire began its 24-year slide from world’s largest midway to a fair buff’s memory. She said the demise of the carnival had many reasons but the primary cause was personnel. Like the slogans on the sides of its passenger cars barked, Royal American Shows (RAS) was indeed the “world’s largest” touring midway in North America for much of the past century, residing atop the carnival heap from 1924 through the mid 80’s. At its peak, RAS boasted a 96-car train -- transporting the carnival staff, carnival equipment and the presidential cars for the owner Carl Sedlmayr Jr, and his family. This method of touring gave the carnival the upper hand on show movement, keeping down travel costs by capitalizing on the fuel efficiency of train travel. Though most railroads gave the train a third-class rating, making it take a siding for all other traffic, RAS made up the time on the road by assembling and dismantling the show with a well-rested and fed crew. “The fastest I think we ever built the midway from unloading the train to being in operation was five hours. We had a very tight schedule between Edmonton and Regina when we closed at 12:00 am Sunday, morning, in Edmonton we had to be fully operational in Regina by 9:00 am Monday morning for Kids Day. The train enabled us to get good rest between cities to enable our staff to perform with this kind of efficiency,” explains Michael Sedlmayr, Laura’s brother. around the fairgrounds, pulling bright red and yellow trailers here and there. “ It was like something out of movie,” he recalls of the buzz. Ron Northcott, another former member of the Regina fair board, says he vividly remembers all the commotion Royal American caused when it pulled into the city. “It seems like there was more kids watching the load-in, than there would be at the fair some days,” he says. In 1982, RAS toured for the first time without the train and by 1999 the midway was out of business, its assets auctioned off at the show’s winter quarters in Tampa. The Western Canadian ‘A’ circuit -- which included Winnipeg’s Red River EX, the Calgary Stampede, Edmonton’s Klondike Days and Regina’s Buffalo Days -- was and generally remains a lucrative run for carnival companies. The fairs are long affairs by carnival standards, at least one week or more, and attract thousands and thousands of people. In the 1920s, most midways simply stopped in a city, set up, played for a few days and then left. 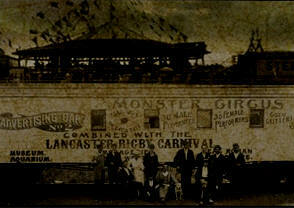 Surprisingly few were featured attractions of fairs. Royal American was awarded the Western Canadian ‘A’ fair circuit in 1934 with a hiatus from 1941 to 1945, when Canada’s Conklin Shows took over during the Second World War. Once the war was over, RAS hit the road with its famed 1946 victory tour and regained the Western Canadian ‘A’ circuit. The 1946 tour, under the guidance of RAS founder Carl Sedlmayr Sr., was greeted in Regina by the Western Canadian Fair board and honored for its return to Canada at the Hotel Saskatchewan. That year’s version of the carnival could not be compared to any other. Sedlmayr Sr., known as the “King of the Carnival” by then, was in fine form, appearing nightly at the grandstand show’s conclusion, pitching his attractions on the midway to make sure no one left the Regina fair without a swing through the rides and games of chance. Sedlmayr Sr. also introduced Regina and Western Canada to some of the best side shows in the business. The all-black “Harlem in Havana” was a musical revue with choreographed dance and song, performed by women clad in very little clothing. The Motor Drome, a motorcycle show, featured a lion driving a motorcycle confined in a 30-foot x 30-foot cylinder. Royal American prided itself on its headline talent. The Western show featured Lash Larue, star of film and stage in the 50’s and Gypsy Lee Rose and Sally Rand, the most sought-after exotic dancers of their time. RAS even gave Colonel Tom Parker his start in show business. Parker, of course, would later become famous as Elvis Presley’s personal manager. The side shows of the smallest man in the world, the world’s largest woman and “The Gorilla Girl,” all played on the midway, with their own “barkers” who would sell the shows to fairgoers with the most exotic verbiage imaginable. Front banner lines painted in vibrant colors and neon lights spelled out the wonderful attractions inside the canvas tents. Laura says her father, like her grandfather, took great pride in his carnival’s presentation. Northcott, who spent two summers working for Royal American, says the American midway was a clean and safe operation. “ can’t remember any major incidents concerning safety,” he says. their largess with men of some influence. “In 1966, mom redecorated the entertainment coach and car 60, mom and dad’s personal coach, to the tune of $150,000.00,” Laura recalls, adding the two rail cars were often used for entertaining guests. Revenue Canada and the RCMP, however, had been tipped off to the possibility of larger gifts -- brown envelopes with thousands of dollars in cash stuffed inside, anonymously left on the desks of fair directors across Western Canada. Unbeknownst to the Sedlmayrs, Revenue Canada and the RCMP began a joint investigation in early 1975 into whether the Tampa-based carnival was paying kickbacks to fair directors in Western Canada. Plain-clothed officers followed the fair that summer, secretly gathering information by spying on the fair’s management in Winnipeg, Calgary and Edmonton. Regina was the last stop on the tour, before the carnival headed south to Milwaukee, Wisc. It was time to make a move. During their surveillance, the undercover officers had failed to witness any direct kickback payments to fair officials. But what they had witnessed in every city, over and over again, intrigued them even more -- the fair was raking in cash by the bundles and the police were sure Revenue Canada wasn’t getting its fair share. With the help of the Regina City Police, RCMP and federal agents raided RAS offices at Regina Exhibition Park on the basis of suspected tax evasion. Sedlmayr Jr., who had taken over the carnival from his father in 1966, was arrested and taken to jail. Many of the games of chance were confiscated and later sold at auction. Sedlmayr Jr. was later released, successfully arguing that he was taken into custody unlawfully. RAS paid its outstanding tax bill of $13,500.00 -- much less than the authorities had presumed -- and left town for Milwaukee and the Wisconsin State Fair. Fair buffs didn’t know it then, but it would be the last time the red, yellow and silver train would ever stop in Regina. In the fall of 1975, charges were filed in Edmonton against Sedlmayr Jr for bribery of a municipal employee, the fair manager. The bribe cracked up to be a transistor radio, dining plates with the RAS logo and a colour television. The rumored envelopes of cash were never found. “It was not Royal American that was the problem,” says Swain. The Regina raid opened the door for Canada’s largest carnival, Conklin Shows, to take over the Western Canadian ‘A’ circuit. Swain recalls other large American midways bidding for the circuit -- including the only one left that travels by train, James E. Strates Shows -- but Conklin was given the nod in part because it was Canadian. It turned out to be a monumental break for Conklin as it has now taken RAS’s place as the largest touring carnival in North America. In addition to the western ‘A’ fairs and the Canadian National Exhibition in Toronto, Conklin has added three B fairs in the west and seven major fairs in the U.S. to its yearly itinerary. Its outstanding tax bill paid, Royal American could have tried to again stake a claim in Canada in 1976, but Sedlmayr Jr., stung by the undercover investigation and ensuing raid, vowed never to cross the border again. “The embarrassment was too great, I think,” says Swain.